In summary: New York City had a life of it’s own in my head. In early August 2016, I visited there for the first time. On the first afternoon we visited Central Park and were there for hours, despite the jet lag. Day One started with a tour of the Intrepid and the Space Shuttle Enterprise, followed by the full two and a half hour cruise around Manhattan – south down the Hudson River into the Upper Harbor, up the East River under the “BMW” bridges, past Midtown and the UN, into the Harlem River, back south into the Hudson River, underneath the George Washington Bridge, past Grant’s Tomb, and finally back into port. To finish Day Two we had a death march to find a cab, went to the Mets game, left early only to miss the best part, and inadvertently stiffed a nice cab driver. Bright & early on Day Three we headed out toward Liberty Island – it’s hard to take a bad picture there, then went to Ellis Island. Once back in port, we took a quick cab ride to our next destination for the day. 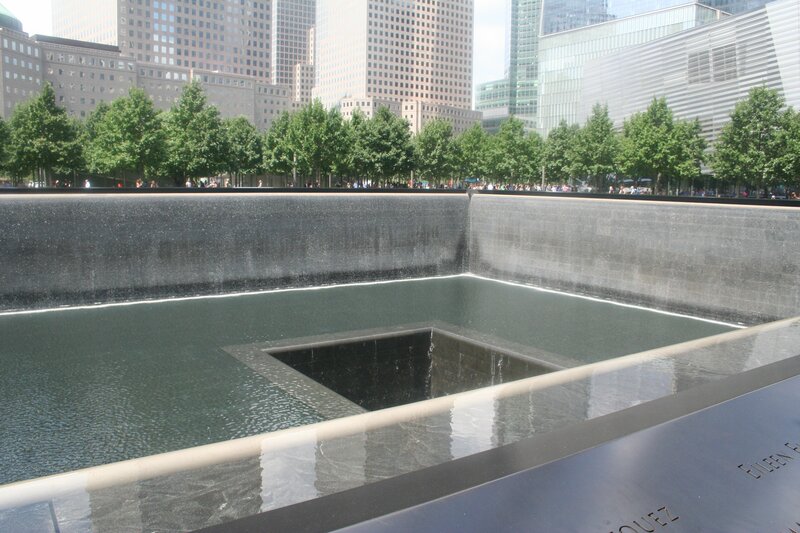 The pools and waterfalls which outline the original twin towers are lovely. I thought that it was a magnificent space, showing how huge the buildings were, giving newcomers such as myself an excellent idea of their placement in their surroundings. We approached from the south so our first view was of the South Pool. 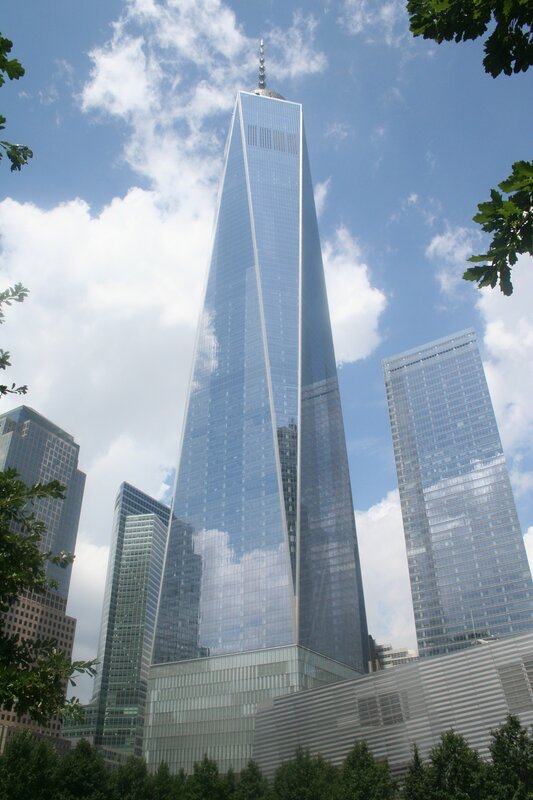 The new tower adjacent to the site is magnificent. As you can see from the earlier pictures from the harbor, Liberty Island, and Ellis Island, it dominates the skyline. 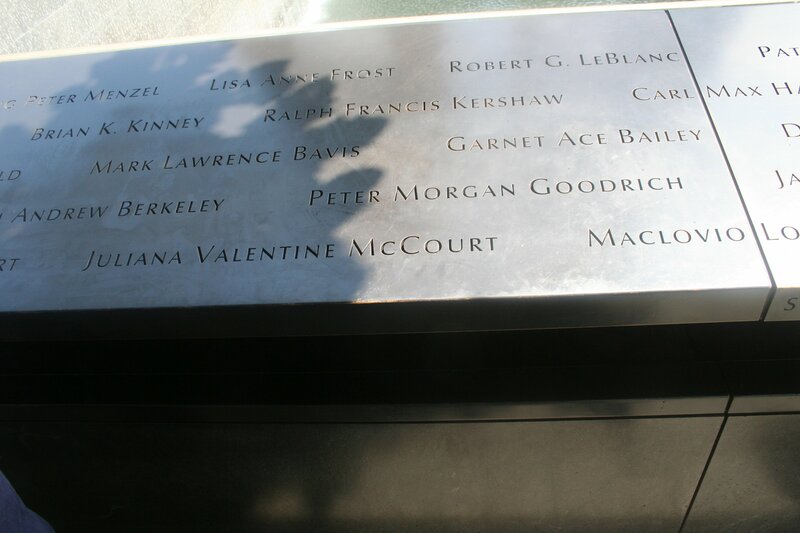 Around the pools of course are the 2,983 names of the victims. There are directories around which can help you find the location of individuals if you’re looking for someone in particular. I was. Entering the museum you take a very long escalator (or stairway) down toward the foundations of the World Trade Center. 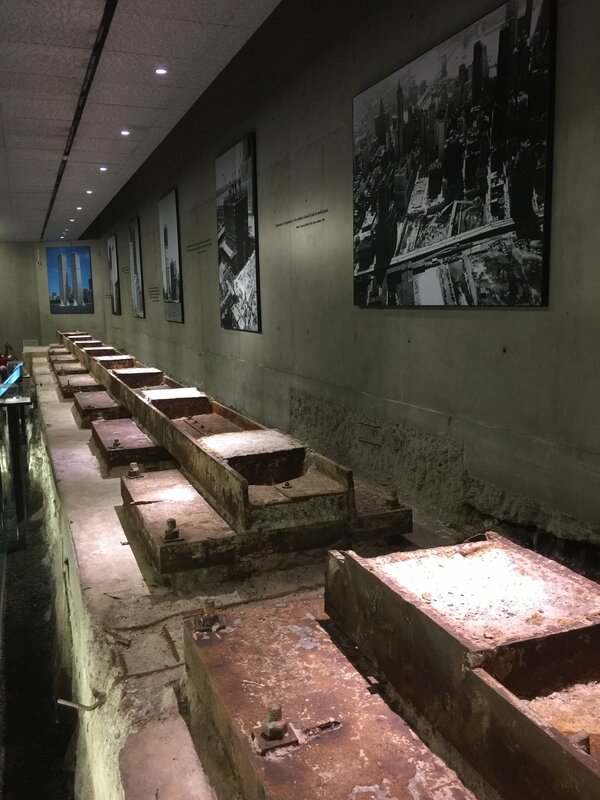 There are many pictures of the site as it once looked, as well as girders from the building and other artifacts. 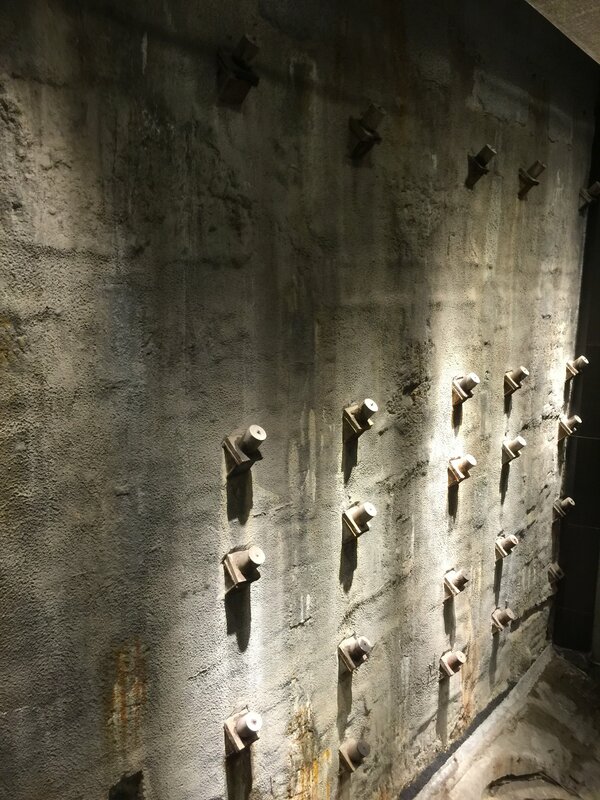 One of the legends of the 9-11 disaster is the slurry wall. 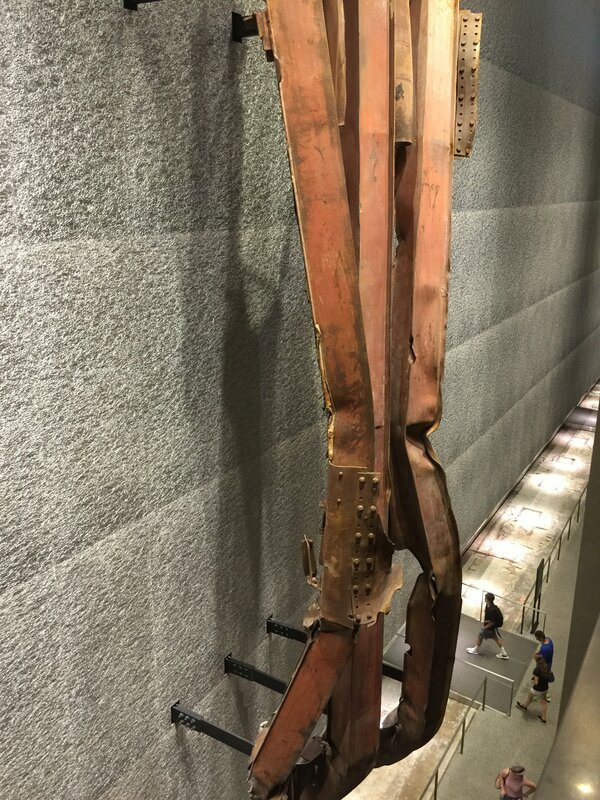 You get your first view of it near the bottom of the escalator. You can look it up and read the whole story, but the short version is that this wall held when the towers collapsed in on it, preventing a far, far greater disaster. This underground wall keeps out the nearby Hudson River and wasn’t built for the kinds of stresses it was subjected to that day. If it had failed, the Hudson would have flooded in, undermining and collapsing other buildings nearby, as well as possibly causing truly massive flooding in the New York City subway system. That could have caused thousands and thousands more casualties as well as damage to the infrastructure that we would still be working to repair and replace. Coming down the escalator you first see the final beam, the last structural girder removed from the debris. You also get your first good idea of how vast this spectacular musuem is. 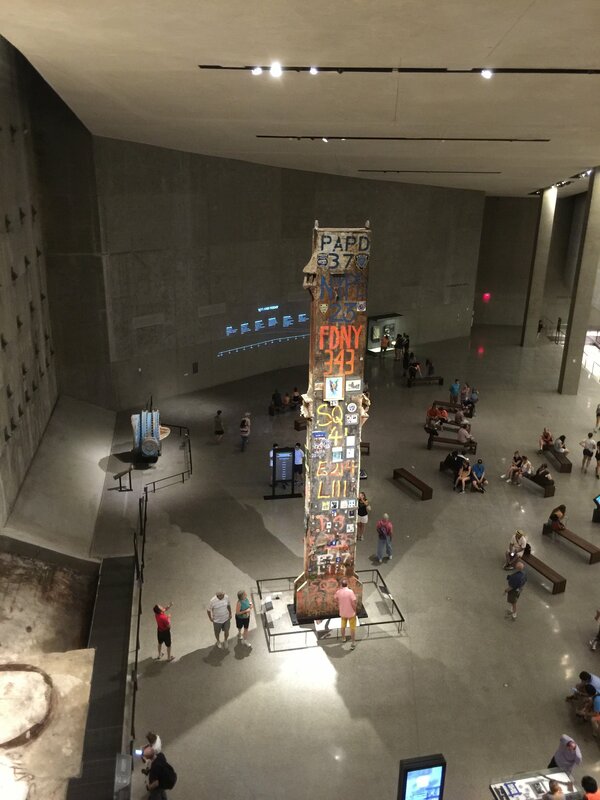 Walking down the ramps and seeing the story of 9-11 told, there are hundreds of artifacts that vividly portray the vast and incredible destruction of that day. 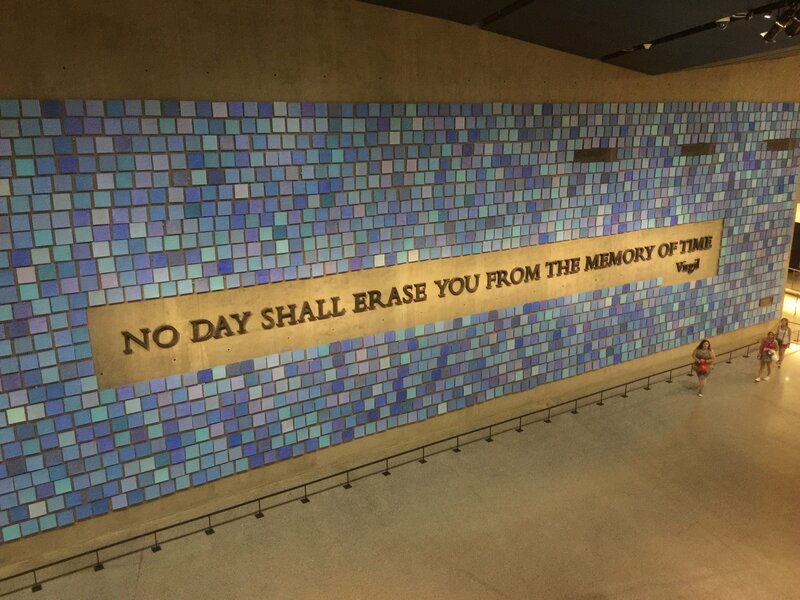 As you approach the bottom levels you see this huge art piece by Spencer Finch – each of the 2,983 panels are painted to match a memory of the color of the sky in New York City on September 11th. 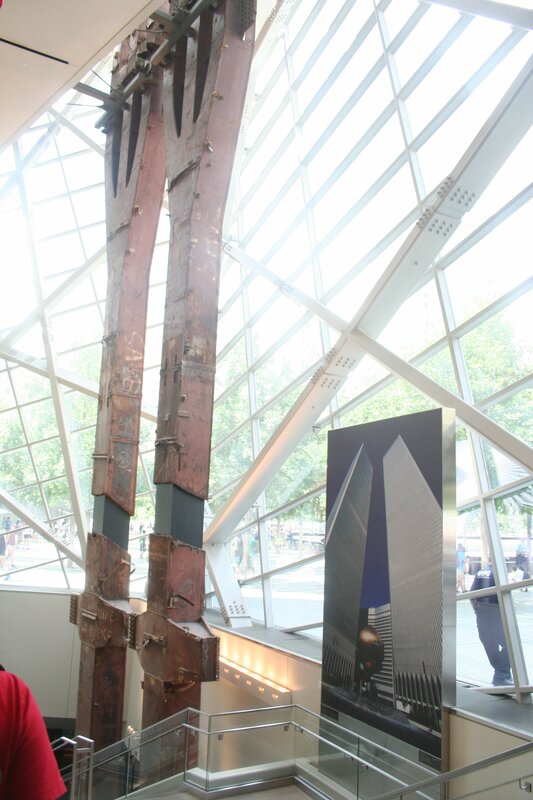 At the museum’s bottom level you can start to see the structural foundations that the Twin Towers were built upon. I had no idea the museum was like that, thanks. Yes, even I remember where I was on 9-11. ‘where I was’ is inaccurate. I recall where I sat/stood, who was next to me… etc. I remember 7-7 even more clearly and thank the powers that be that I was lucky.